Get ‘Er Done on the First One. “One-and-Done Pass” With The Purple Books. 98% successful pass rate – 20+ years. Are you ready to pass? 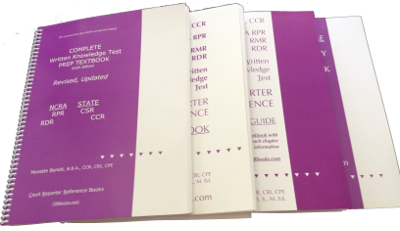 Study The Purple Books To Pass The * RPR, *** RDR, and ** CSR The First Time! Books; CDs; career coaching, tutoring with Monette Benoit, the Court Reporting Whisperer; free articles to advance skills for national RPR, RDR, and State CSR test prep certification material; real-time writing; CART captioning; dictionary building programs; and vocabulary preparation. School Discounts. Absolutely dedicated to schools, instructors, students, reporters, and CART Captioners. The only NCRA RPR, RDR, and State CSR textbook to prepare reporters, CART captioners, judicial reporters, students, and instructors for NCRA and State written tests, court reporting boards. Study, drill, quiz, review, understand and then… PASS YOUR TEST the first time! Documented 98% success first time pass. Computer Terminology, Technology, Ethics technology, ** NCRA COPE Advisory Opinions; Suggested study material, Review, and More. Experienced and novice reporters, CART captioners, judicial, realtime writers and students will improve skills and advance credentials. All information is presented to maximize retention. Designed by court reporters and educators for court reporters, students, CART captioners, program directors, and instructors. 3rd Book – Link: ’Test Prep Companion Study Guide Book, 4th Edition’ ~~~ “Test Prep Workbook” is required with this book as it cannot be studied alone. Explanations for all 2,002 practice test questions and each a-b-c-d answer are defined to enhance your study time. Additional testimonials may be read. I ordered the Test Prep Set: Complete NCRA, RPR, RDR, and State Written Test Prep Textbook, 6th Edition; NCRA RPR, RDR, and State Written Prep Workbook, 4th Edition; Companion Study Guide, 4th Edition; and Realtime Vocabulary Workbook, 3rd Edition. I’m addicted! I love the Latin, vocabulary, grammar, all the quotes and motivational poems, and all the updated, detailed technology! These books are blowing my mind. “Originally, I failed the RPR Written Exam — Twice!! That test was a ‘got-ya’ both times, and I studied both times, and it cost me a lot of money to FAIL that Test TWICE!! I’m a working court reporter in court. I realtime every day — have since day one. That’s where you came in. I purchased the material from Court Reporter Reference Books. Easily – and I mean easily, I passed the RPR, and THAT’s not an EASY test! I’m serious. Use my words; share them, so others do not take that test more than once. The cost of the books is cheaper than the registration to take the test a second or even a THIRD time — LIKE I DID. Your motivation, focus, and concise sharing in the books is proof that had I had the books for the first exam I KNOW I WOULD HAVE PASSED. Now, I’m certified, as the court required when I accepted this position. And I’m also smarter. That test is now behind me… way behind me. I’ve now set my goals higher and bigger! Now, I want tutoring and coaching with you. Thank you, Monette. Monette Benoit’s materials, http://www.CRRbooks.com and CATapult CD series, are wonderful for dictionary building and test prep, too. They are highly recommended by captioning companies for transitioning reporters and have been a tremendous help to me. I passed my RMR written exam! They were extremely helpful — it shows how hard you worked. Your books really helped me pass the NCRA RMR written, WKT, so thanks so much! Bravo! Bravo! What else can I say except that you have done a tremendous job. What a job it must have been researching all that material. You must have spent an enormous amount of time putting together the CSR, RPR, RDR Written Knowledge Test Textbook and Workbook. I am sure that the students who use your books to prepare for the WKT, written exam, must sing your praises. I believe that not only are your books helpful for test taking, but they are an invaluable asset to one’s reference library. The poems you included are inspiring, encouraging, entertaining, and brought smiles to my lips. Thank you for the books. Monette, I wanted to say thank you. 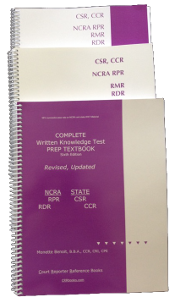 I passed the NCRA RPR written knowledge exam, WKT, the first time after I ordered your books. They are great. I only wish I would have had them the first time I took it. Everyone I spoke to about you said that you are so proud and enthusiastic about court reporting. It is nice to know there are people like you who are willing to reach out and lend a hand to those who stand in the same position you used to many years ago. Thanks!! You may use my testimonial. Hopefully it will help others. I passed the NCRA Written Knowledge Test with a 97! I am so proud and relieved by accomplishing one hurdle in the midst of my patient prodding. Thank you for the NCRA written exam, WKT books, which I found on Court Reporter Reference Books, http://www.crrbooks.com, to prepare students and court reporters for this hurdle. I now know that this that can be achieved the first time with proper studying and knowing how to take a test. I have to tell others taking the state CSR and NCRA RPR tests. Many people are taking the test for a second time – or more. This was huge. Thank you! Much of the information that I studied from Monette Benoit’s material appeared on the NCRA RPR written examination. The success that I had in passing the NCRA RPR Written Knowledge Test, WKT, is due to several factors. One major factor is the use of the study material written and taught by Monette Benoit. This study material consisted of information derived from years of personal experience and knowledge as a court reporter. This information combined medical and legal terminology, spelling, vocabulary and grammar, as well as reporting procedures. As a student not knowing what sources to consider, I felt inclined to study this material equally as I did the “WKT Workbook” and academic tests. Monette has a strong desire to help the court reporting students succeed in their field. I believe her study material is a wonderful tool that should be utilized by students and court reporters everywhere as an aid in passing written knowledge tests. Thank you, Monette! You have helped me jump a major hurdle in my career! The more words you know, the more accurate will be your speaking, writing, thinking, and reporting. Monette Benoit will inspire you to make vocabulary-building a joyful and lifelong pursuit. You have to picture me with active children — each day. I’m always happy to give a testimonial about your products because they are all good. All my students, from way back, loved the dictation material “Popcorn Q & A” and the books: WKT CSR, RPR, RDR Text, Workbook and Study Guides. Your Handbooks are great! And the Sports ‘CATapult’ CD is fun to work on. Monette Benoit’s ’CATapult’ CDs are my ticket into the broadcast captioning arena. They are a very important part of my practice routine and have helped me immensely. The CD’s are yet another example of Monette’s high quality resources that are available to help us all be better reporters and captioners. This is good stuff, down to earth and on the level that working reporters need. 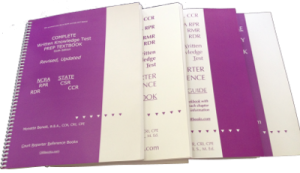 From now on, our court reporters are going to get to know the CSR, RPR, RDR Written Knowledge Test Textbook, Written Exam Workbook, and Realtime Vocabulary Workbook by Monette Benoit better than their childhood teddy bear, dragging them around everywhere and maybe taking them home to bed.